Poached Pears in Red Wine is a signature french fruit dessert which is both easy to prepare and delcious to enjoy. Better known as “Poires Au Vin Rouge“, this french classic uses port or some other full-bodied fortified wine as a base for a thick syrup enriched with spices. 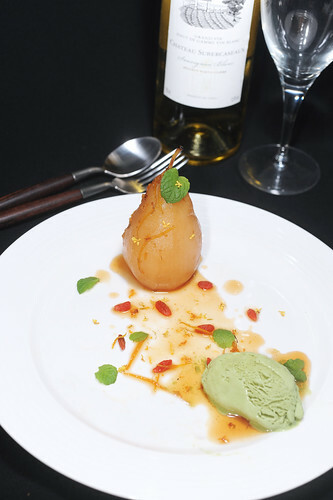 Its origins can be traced back to another French dessert named Poire belle Hélène created by by Auguste Escoffier, named after the operetta La belle Hélène by Jacques Offenbach. Incidentally creating desserts after popular themes or famous people seemed to be Escoffier’s favorite past-time speciality as he also gave us Pêche Melba, after the famous Australia prima donna. Jacky Wu of 囍宴 Xi Yan, a restaurant chain in Hong Kong and Singapore specialising in the concept of “private dining” decidedly gave this dish an Oriental twist with their restaurant signature “囍有此梨” 桂花陳酒燴啤梨 Poached Pear in Aged Osmanthus Wine, with the incorporation of 桂花陈酒 aged osmanthus wine from China. The palate experience provided is quite different from that of the original Poires Au Vin Rouge but no less enjoyable!